Cheshire Cat Photo Blog (… said the Cat: 'we're all mad here….') » Blog Archive » Red or White? That was my emailed question to the Livermore Art Association (LAA) Vice-President, Angela, an artist who accomplished wonderful things for the Arts in Livermore, in her four years as LAA President. And she continues to do so…! But I was not asking about wine (THIS time! )…. 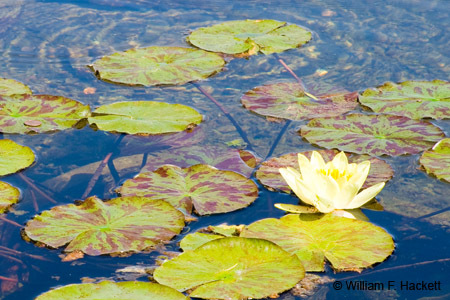 I was responding to her message that one of the two photographs of water lilies in the original fountain of Mission Santa Barbara that I had entered in the U.S Bank Show in Downtown Livermore, CA had won the “Best of Show” award! But which one…? The red or the white…? Finally, this afternoon, I could take the suspense no longer, and I toured the show. 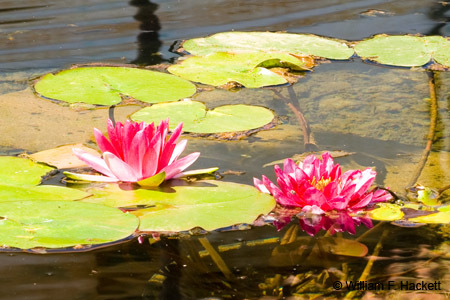 The fine art print in question was “Water Lilies, White, Mission Santa Barbara.” Its companion piece (they really belong together, with the red hanging to the viewer’s left of the white), “Water Lilies, Red, Mission Santa Barbara” is hung right below it. See which one you like better. Of course, I am very happy! In touring the show, I was delighted by the wonderful collection of art submitted by members of the LAA – from paintings, to photography, to mixed media, to 3D. The show will run through July 6, during normal bank hours. Coincidentally, one of the LAA Circuit photography groups, of which I am a member, has photographs (I have four) hung on the walls of the bank, as well. Come see the wonderful collection of art. Be sure to thank the folks at the bank for supporting the Arts in Livermore! You can view higher-resolution photos (*generally* 7-30 megabytes, compressed) at the Cheshire Cat Photo™ Pro Gallery on Shutterfly™, where you can also order prints and gifts decorated with the photos of your choice from the gallery. Apparel and other gifts decorated with some of our most popular photos can be ordered from the Cheshire Cat Photo™ Store on CafePress®. Both Shutterfly™ and CafePress® ship to most international locations worldwide! Framed prints and prints on canvas can be ordered from our galleries on imagekind® and redbubble®. All four locations are accessible from here. Be a “Facebook Fan” of Cheshire Cat Photo here! If you don’t see what you want or would like to receive an email when new photos are up on the site, send us an email at info@cheshirecatphoto.com. ©2010 William F. Hackett. All Rights Reserved. "Red or White?" was written on June 8th, 2010 by Bill, and filed under California,Photography,Uncategorized. Previous: The Geezer Bandit strikes again!